More happenings on La Brea: according to The LA Times' Daily Dish, a Bottle Rock co-founder has launched Umami Burger (a spot dedicated to 'the Japanese fifth taste' alongside sweet, salty, sour and spicy). Not sure if that's a yummy prospect or not. The idea seems a bit one note, but I still totally want to check it out. Isn't it weird how an abstract concept can become trendy? Suddenly, everyone has umami fever. Maybe I should make t-shirts that say, "Whose U-mami?" (That was bad–sorry). I'm just waiting for the "Umami Elimination Challenge" on Top Chef. (If all the contestants were still on the show, Jamie would make umami scallops, Fabio would make umami pasta, Jeff would make umami 800 ways and Leah would leave scales on umami fish). 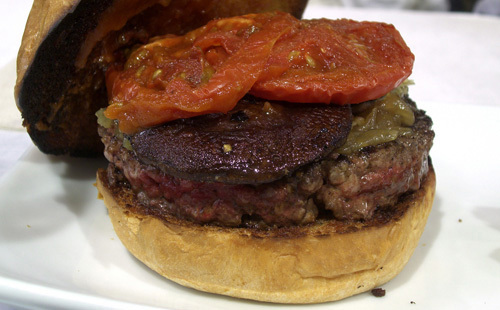 That said, I'm a big fan of the burger and sausage movement happening in and around LA right now: Umami Burger, 8 Oz. Burger Bar (where I LOVE the chorizo stuffed fried olives), always Father's Office, Golden State (still waiting), Wurstküche and more. Pretty, pretty good. (Oh, how I miss my Curb).